Did Captain Sully Lose a Library Book in the Crash? Is it true Captain Sully called his local library to let them know a book he borrowed had made an unexpected visit to the Hudson River? We, er, checked it out, and that rumor has wings! And the library was so impressed with the Captain's honesty, they waived his lost book fee! 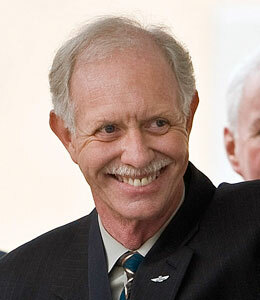 The Fresno State library also dedicated a replacement copy to heroic Captain Chesley "Sully" Sullenberger! It gets better -- the book was about ethics! The Captain also broke news in an interview with ESPN, saying that the moment the engines failed, it was the silence that was shocking. Since the crash, Sully and his wife have spent many evenings in tears reading all the emotional fan mail.